The Food and Drug Administration is spending $36 million on an anti-chewing tobacco advertising campaign targeted at white male teenagers in the midwest. The federal agency announced Tuesday it is expanding its “Real Cost” anti-tobacco campaign to “educate rural, white male teenagers” and convince them to stop dipping. The campaign will run television, radio, and print advertisements, as well as put up public signs and billboards and post on social media. The agency is also partnering with two dozen minor league baseball teams in the midwest that will host anti-chewing tobacco events and feature advertisements from the campaign. “Amplification of messaging from the campaign will take place at 25 Minor League Baseball stadiums throughout this summer using a variety of efforts, including sponsoring in-stadium events, the placement of print ads, running of television ad spots, and opportunities for fans to engage with players who support the FDA’s efforts on smokeless tobacco,” said Tara Goodin, an FDA spokesperson. The list of minor league clubs participating in the campaign includes the Albuquerque Isotopes, the Fargo-Moorhead Redhawks, the Traverse City Beach Bums in Michigan, the Sioux Falls Canaries, and the Burlington Bees, an Iowa farm team for the Los Angeles Angels. Chewing tobacco has been banned at ballparks in Los Angeles, San Francisco, and Boston, including Fenway Park, and major leaguers can face $250 fines and “are subject to discipline” from Major League Baseball’s Commissioner Rob Manfred if they dip during games. 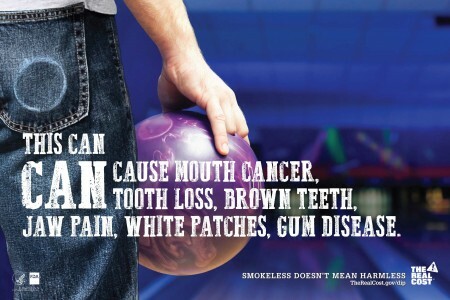 The FDA provided an example of one of its new campaign ads, which features a man at a bowling alley with a can of chewing tobacco in his back pocket. “This can can cause mouth cancer, tooth loss, brown teeth, jaw pain, white patches, gum disease,” text on the ad reads. The campaign is targeted at white males aged 12 to 17 who are using smokeless tobacco, which the FDA estimates to be 629,000 nationwide, or 0.19 percent of the U.S. population of 318.9 million.